The next major programming step for the Xsight Touch is “Activities”. 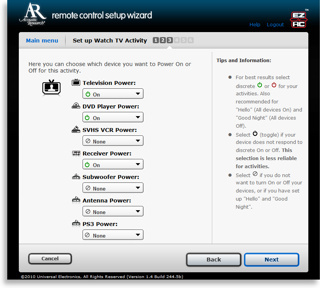 Configured activities can be accessed from the remote’s [1-2-3] system hard button, or from the option on the Home Menu. So what exactly are activities, and how do they differ from the traditional device concept? Universal remotes with a strictly device-oriented design could be described as “individual remote controls stored in a single housing”. 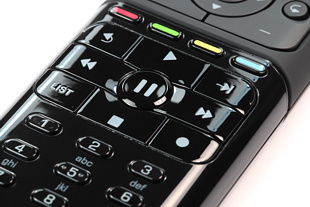 That is to say, if you wanted to watch a movie you would first change the remote to “Television”, turn on the television and set the input, change the remote to “Receiver”, power on the receiver and change the input, then change the remote to “DVD”, power on the DVD player and eventually press [Play]. That certainly doesn’t sound very convenient, but fortunately few universal remotes actually make you go through such gyrations. Activities are a way of merging all those separate devices into simple everyday tasks such as “watch a movie”, or “listen to the radio”. Activities automatically configure your system’s power and inputs to the correct states using macros, and then present you with a list of commands that you’ll need to complete that activity. While activities are almost always tied to a single source device, they may offer commands from multiple devices. So while the primary device for “watch television” will likely be your cable box or satellite receiver, the activity may also allow limited control over secondary involved devices such as your A/V receiver, display and lighting system. In the end, an “activity” is primarily a marketing term used to sell the idea of an easy-to-use remote control. Most of the functionality can be replicated by any device-based remote capable of macros, punchthroughs and code learning, but remotes built entirely around the activity concept often include other advanced features to help make them more reliable for daily operation. Adding an activity brings up two choices: basic or advanced setup. The basic option entails six steps. First, the wizard asks you to select from a list of suggested activities based on your configured devices, and then provide that activity with a friendly name. The next screen is for selecting the desired power states of your components. Devices in your system can be configured to be on, off, or left alone for each activity. UEI’s preprogrammed database includes a wide range of discrete power codes, which will help make the macros associated with your activities more reliable. If for some reason these discrete codes don’t work or are otherwise unavailable for your brand or model, a standard “toggle” power option is also available, but as the on-screen tip indicates this is generally an unreliable choice. The fourth screen sets up the Xsight’s automatic punchthroughs, where you can choose which devices will be used with the channel, volume and transport hard buttons. The wizard does not make useful default selections here, so you’ll need to double-check that all of these are correct for each activity. 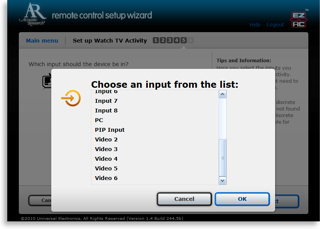 Step five entails telling the wizard which inputs your television and/or receiver should be on. The list of available inputs is drawn from all available discrete input commands in UEI’s code database, and may not match what your device actually has. The final step involves a forced on-remote test of the activity’s startup macro. After the test runs – with no input requested during the test – the remote is reconnected and the wizard finally asks if everything worked. If not you can make further changes, or run a basic troubleshooting wizard. Ideally the on-remote macro test should itself provide basic troubleshooting and offer various logical alternatives. With the current method, the user may need to go back and forth from their PC to test potential changes one at a time.